One of the more interesting features of cars produced early in the 1968 model year is the dual serial number. These dual serial number cars actually have two separate numbers stamped on the under hood tag. This should not be confused with the Shelby dealer order sheets which continued to use these unique codes throughout the model year. The first number is the Ford Vehicle Identification number. 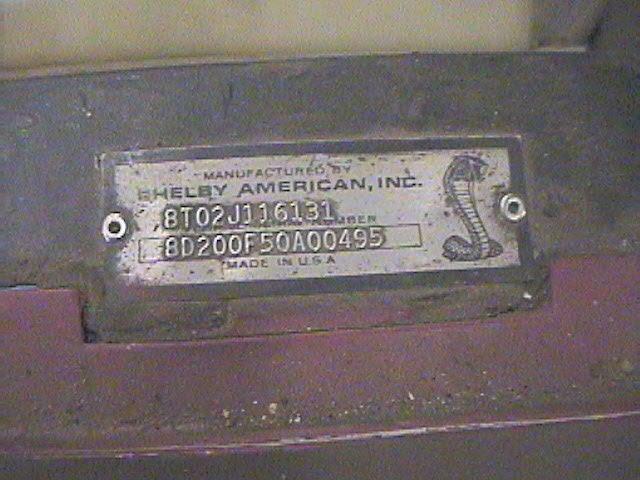 By studying the 1997 Shelby American World Registry, it has been determined that the dual serial number cars were all built by Ford beginning November 20, 1967. The final cars were built by Ford on or around December 8th, 1967. This group of cars was sent to AO Smith via railcars. Most likely all were among the very first 1968 Shelbys built by AO Smith. Because Smith stored cars after assembly, some of these cars were not actually shipped to dealers until much later. That is why dual serial number cars are mixed with cars that do not have the dual serial number feature. It is not entirely clear why Shelby moved away from the dual serial number concept, but it is believed the numbers could be simplified by combining them. I am sure two factory Vehicle Identification Numbers (VINs) at the Department of Motor Vehicles led to some confusion. The second VIN closely resembles the the 1967 Shelby style VIN. This VIN can be broken down to reveal additional information about the car. Strangely enough, it does not appear the first four 1968 Shelbys built had dual serial numbers. This may be because the cars were not serialized when they were built. The cars may have received their Shelby numbers at a later date. I believe all four of these cars were initially assigned to the engineering department.